We are back from our week long holiday in Morocco and I have tonnes of photos and stories to share. But all that have to wait as this is the last week of 6 weeks long summer holidays and I want to spend as much time as possible with LD doing, well, nothing! Yes, nothing! 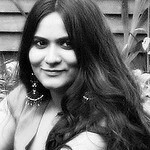 When I was young, I remember my parents leaving me to entertain myself by reading a book, going for walks in the hills and woodlands with my friends and siblings, creating little pots and pans with clay, lying under the mango trees and waiting for the mangoes to fall down, and then they let me get bored! It was during this time of boredom I would sit in the balcony outside my room and look at the random things and build a story around the subjects. The floating cloud was looking desperately for a friend, the man with a long, thick moustache was the president of world moustache federation, the girl with a long thick braid was actually wearing a black cobra which hissed if I tried get too close to check it, the cat sitting on the fence would change its form to a mighty tiger in the night etc, etc. I was a child with vivid imagination who loved to spin stories during this time of boredom and it’s only much later time in my life I realised how my parents deliberately let us get bored to activate those imaginations and creative cells. While I was spinning tales of this land and far beyond, my sister got busy with colours, creating vibrant paintings and the baby brother created havoc and got into mischief by scribbling stick mans and hundreds of eggs in our school note books and walls! :) And this is what I want to pass on to LD, a legacy of boredom which I call an ‘art of doing nothing’. LD and I have been spending time together doing things that we like. While I am spending most of my time reading the books that have been collecting thin layer of dust for the past few months, LD is occupied with paints, dinosaurs, imaginary friends and his story books. And then we spend most of our afternoons picnicking in the garden, just lying under the shade of a tree and watching the clouds drift by. In between, we go foraging berries in our garden and in the woodlands nearby and sit by the stream of gurgling water watching the leaves change colour and fall down on the water and float away… With nothing to distract us, this is something that I have come to enjoy more and more with LD by my side on weekdays, and the husband joining us on the weekends. I have now come to seriously believe that the ‘art of doing nothing’ can be the most beautiful thing you can gift to yourself and your child. 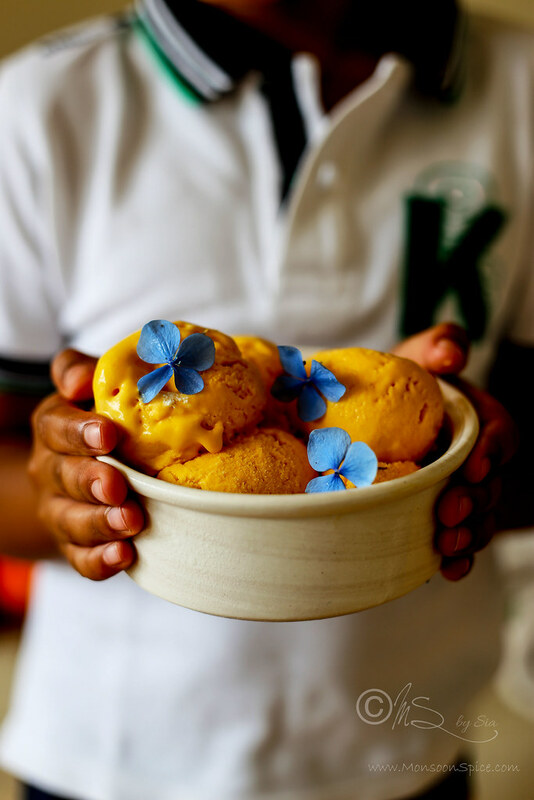 And another occasional sweet present you can gift yourself and child is this No-Churn Three Ingredients Mango Ice Cream! 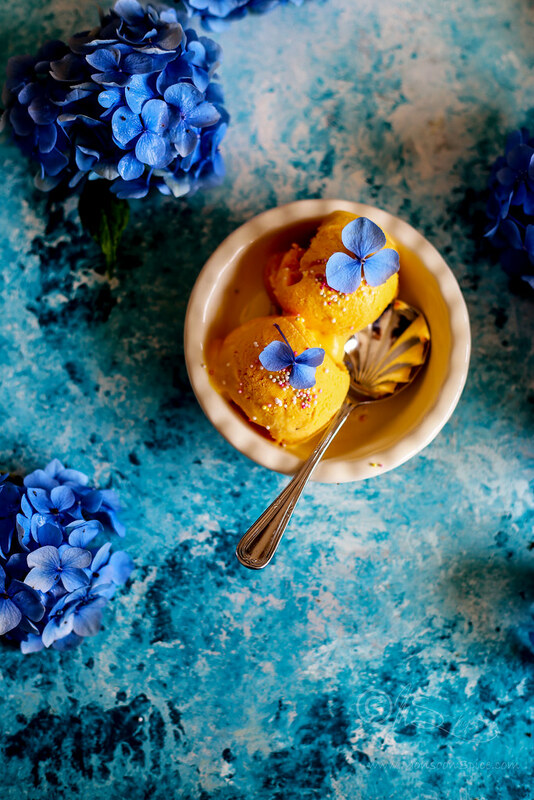 Yes, just 3 ingredients ice cream that can be made without eggs and ice cream machine and also takes just 10 minutes of prep time! 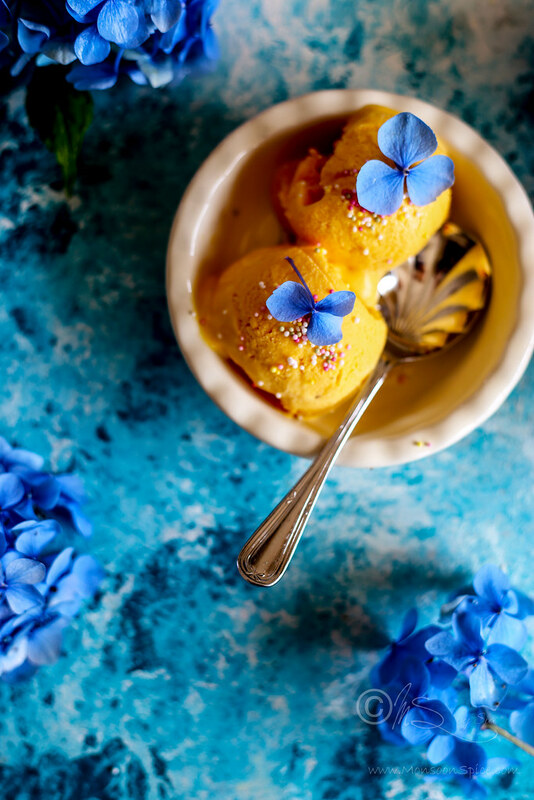 Hallelujah… I made this No-Churn Mango Ice Cream a day before we left for our holiday and shot it amidst all that last minute packing and all that madness that comes with a day before flying! 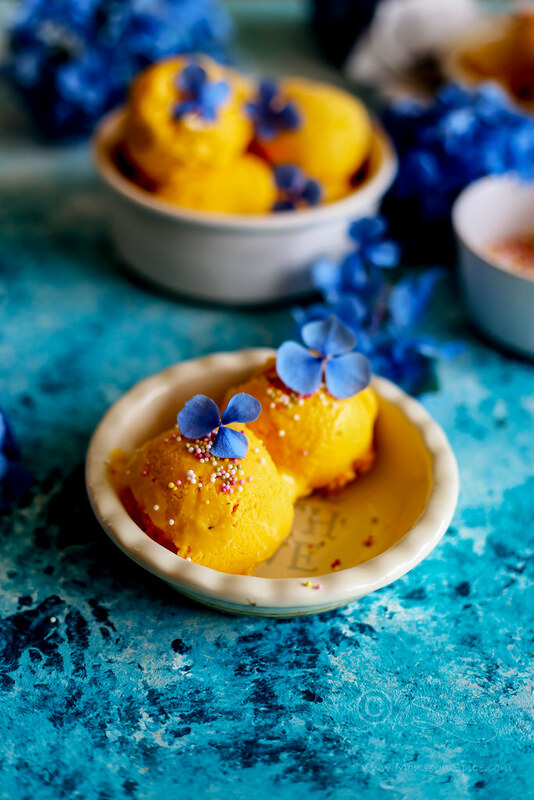 Although I didn’t get enough time to style and photograph the way I planned with perfect scoops, garnish and all, I am still going ahead and posting this recipe as it was too good to sit in draft for ever! The thing about this recipe is that you do it in advance, but what you do in advance is negligible in terms of effort. 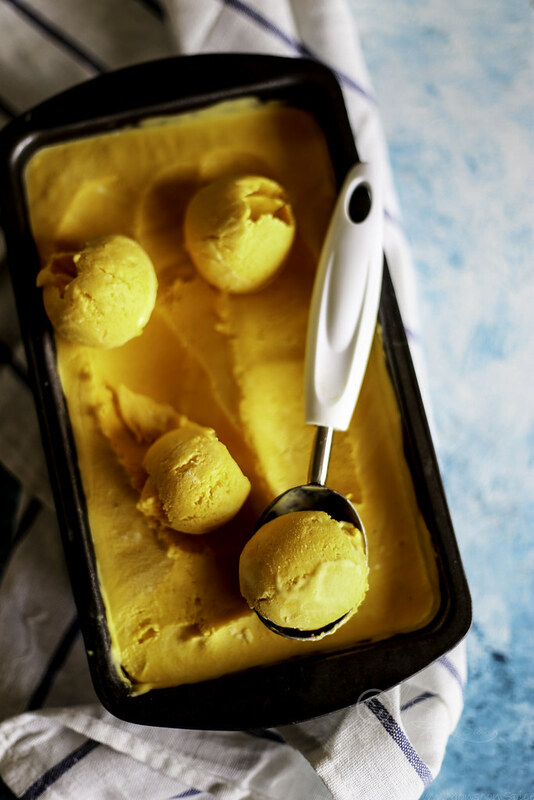 Unlike traditional ice creams, you don’t make custard which is a sweetened base for the ice cream usually prepared by cooking a mixture of heavy cream and sugar with eggs or corn starch and then churned in an ice cream maker before freezing. 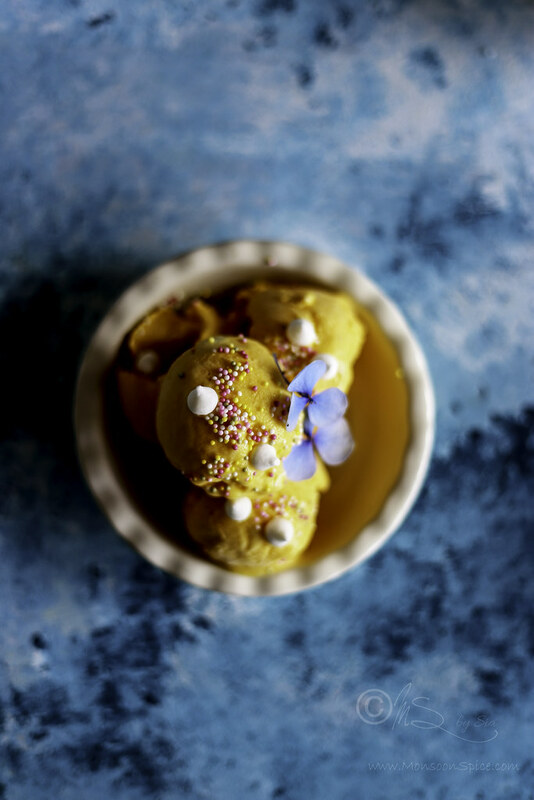 When this custard is churned in an ice cream maker, it incorporates air and breaks up ice crystals as they form which in turn gives a smooth and creamy texture to the ice cream. 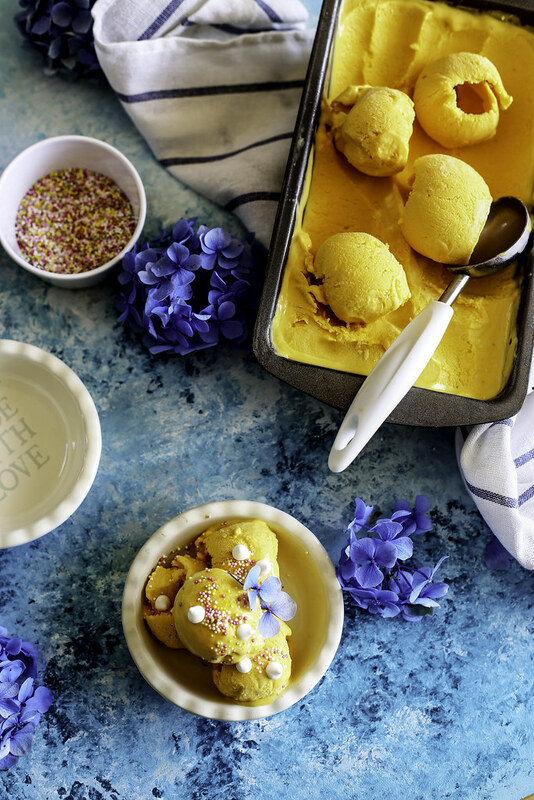 In this recipe of no-churn ice cream, it’s the sweetened condensed milk which takes place of the base and the whipped cream is that magic ingredient that gives the ice cream airy and creamy texture. Whip the heavy cream until thick and quite stiff, bit like clotted cream, and then combine the condensed milk and the mango puree before popping it in the freezer for it to set. 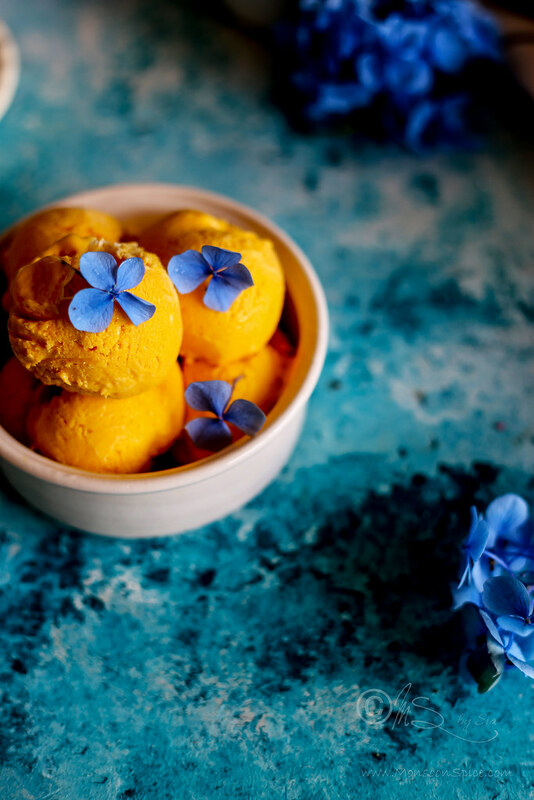 The final result is a delicious Mango Ice Cream which is velvety smooth in texture and easily melts in mouth with no trace of ice crystals! 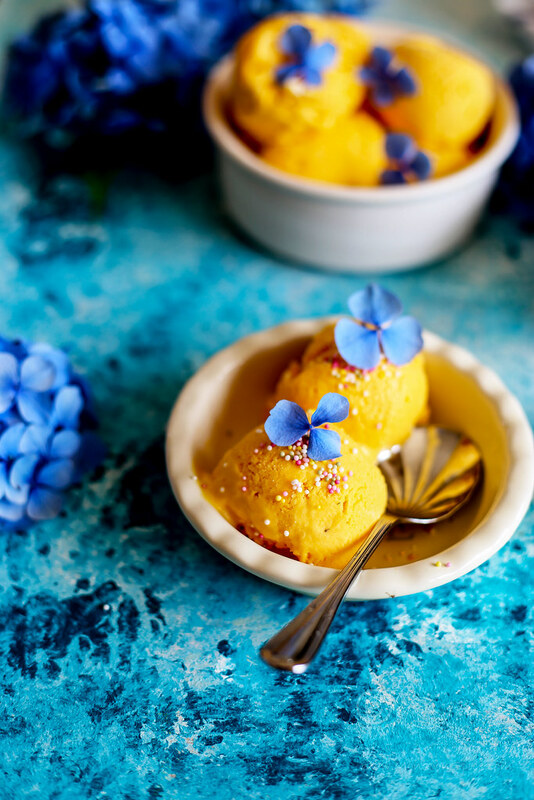 Sweet, smooth, creamy, rich Mango Ice Cream that tastes like a burst of summer is what one needs to slow down and enjoy the simple things on life! 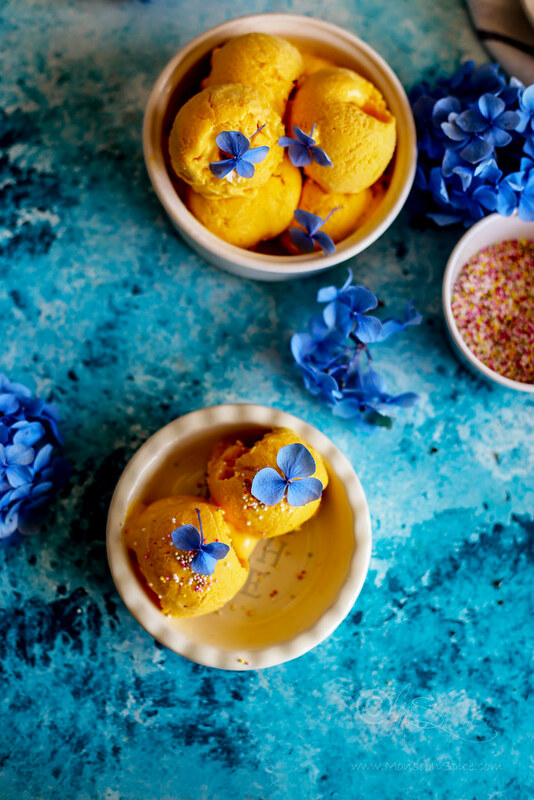 So go on, try this ridiculously simple 3 Ingredients, No-Churn Mango Ice Cream and enjoy the last few blissful days of summer! Take double cream/heavy cream or whipping cream in a large bowl. Beat with an electric whisk until thick and quite stiff, a bit like clotted cream. Mix condensed milk and mango puree and continue to whisk for a minute or two until everything is incorporated well. Scrape the bowl and transfer the contents to bread loaf tin or any container with lid. If using bread loaf tin, cover it tightly with a cling film or aluminium foil and place it in a freezer for the ice cream to set. I left it in a freezer for 6 hours. To serve, remove the container from a freezer and leave it on a kitchen counter top for 4-5 minutes. 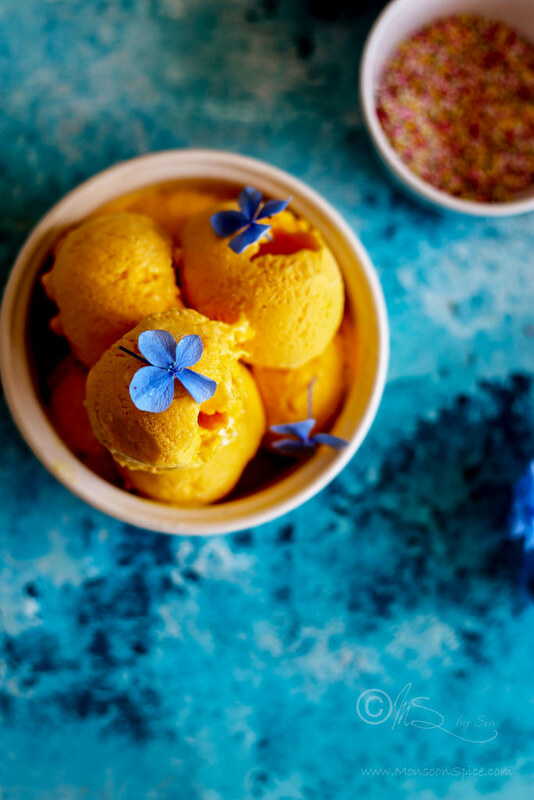 Scoop out the creamy and delicious No-Churn Mango Ice Cream with an ice cream scoop or a large spoon and serve garnished with dried and chopped nuts like almonds, cashews or pistachio or sprinklers or mini meringues or any garnishing of your choice and enjoy! I have used canned Kesar mango puree in this recipe which is quite sweet with little hint of tartness. Feel free to use any fresh mangoes in place of canned ones. I didn’t need to add any extra sugar as the sweetness of condensed milk and mango puree were enough to suit our taste buds. Feel free to add extra sugar if you like really sweet ice creams. Make sure that you whisk the cream well as this helps in getting velvety smooth texture to the ice cream. 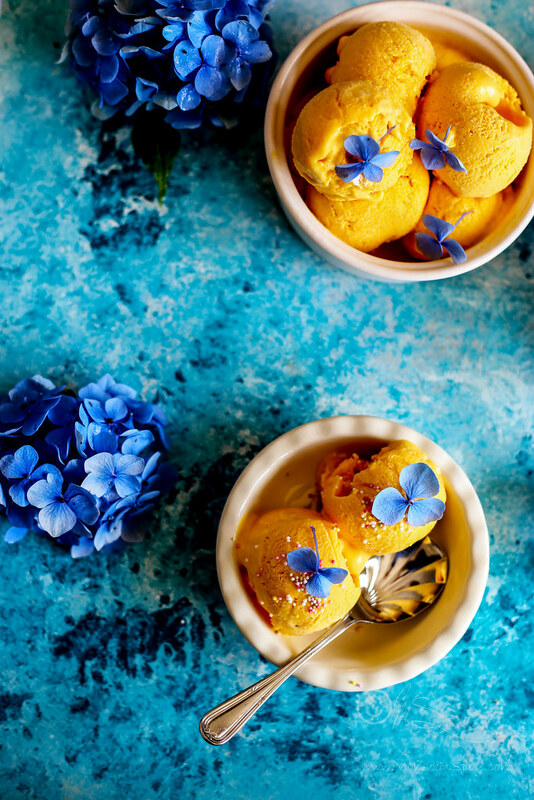 You can substitute mango puree with any other fruit purees and create as many flavours of ice cream as you want. 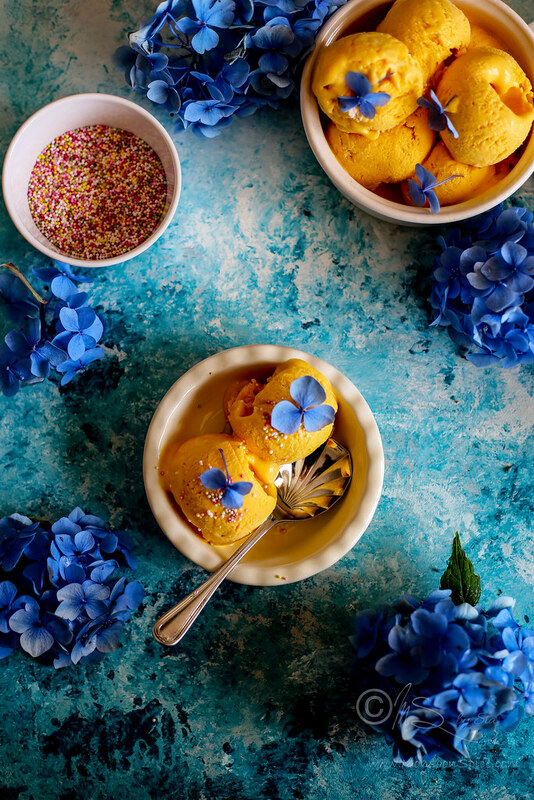 Oh the mango icecream looks mouthwateringly good. Your photo styling is so wonderful!! This looks absolutely incredible! I can't wait to try it in a couple months, when its blistering hot here, in Australia. I tried out your punjabi aloo gobi last night and it was great (coming from someone who's eaten cauliflower about twice in her life)! Will definitely be making it again, so can't wait to try out this one. Superb clicks and looks so so good. Btw just wanted yo ask you, I tried clicking the instagram icon on top to follow you, but it shows as page not found. Oh god! This is first time I hear and read this easy and time less ice cream method. I am feeling very happy that to this is beautiful and tasty mangoes season. So ICan enjoy with ice cream. Thanks Mr sia. Please tell us some more methods. We are weighting. Hi sia. Tried the recipe. Came out great.. I made this ice cream at home and it came out very good! Tastes like mango and it's creamy. Since I have an ice cream machine I used it, however I noticed that it was creamy even when not churned which is good. I added some lemon juice and zest as I felt my pulp was not tart enough for my taste. I also made my own condensed milk because I can't find it easily, it's easy to make, I even used coconut milk instead of cow's because it's fatter and so it forms less crystals. Now I have a very creamy and fruity ice cream with no crystals at all, thank you.